Wow! This is John A. Heldt at his best. (There are still two of his 11 books from other series I am yet to read so it may be nudged from its number 1 rating). The story begins with heartbreak when, following a miscarriage and years of trying to conceive, Claire Rasmussen and her husband, Ron, enquire about adoption. After learning the waiting time is six years, and extremely expensive, it seems like their longing to become parents may remain a dream. That is, until Claire’s uncle, Professor Bell, provides a solution. Having experienced this trauma myself, I can honestly say the author has an outstanding understanding of what couples go through in this situation. He describes their heartbreak and yearning accurately with emotion and sensitivity. Along with Claire’s brother, David, they travel back to 1945 when adoption was faster and more simplified. Their experiences during this time, the final months of world War II, prove to be not so easy. Their lives become a whirlwind of romance, danger, suspense and uncertainty. Yes, it is a time travel story but rather than being science fiction it is drama, emotions, danger, history and suspense. In other words, it is a darn good read. Regular readers of my blog (www.pam.id.au) and reviews will know I am a staunch John A Heldt fan. 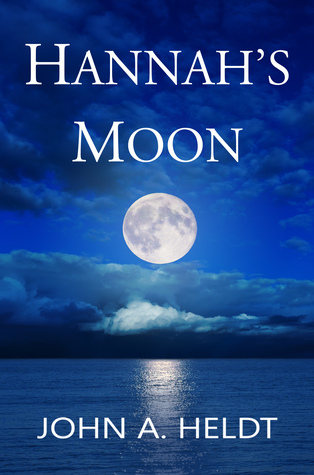 Hannah’s Moon is the fifth, final and best of his American Journey series. This is a very special story that is a must read. Heldt is an amazing story teller. His skills have produced an engaging story that flows consistently with likeable characters and reality; one that will have the reader misty eyed, laughing and biting their nails. The characters are well developed and believable. As it is told through the perspective of each of them, I felt I was living their experiences alongside them. One little touch I loved was when even the brilliant Professor and his wife had some difficulties with time travel. Hannah’s Moon is a wonderful conclusion to the series – or is it? At the end of the story the characters from the other books are brought together and, if you have read these, it tells how his previous adventurers have fared. If you haven’t there is enough explanation not to feel you have missed something and, I believe, enough to have you going back to read them. The final part concerning the Professor and his family also opens the door for yet more of this amazing man. As always, my only complaint about all of John A Heldt’s books are that they are not in print – I would love to have them all on my bookshelf. If, or should I say, when, you read Hannah’s Moon be sure to include the acknowledgements. They show the author’s commitment to accuracy of his time periods and history through research and consultation. I received a copy of Hannah’s Moon from the author with a personal option on reviewing the book. My rating? To date, I have rated all of Mr Heldt’s books 4 or 5 stars and this is definitely a 5*. I just wish I could give it more.